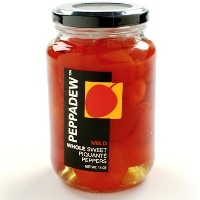 In case you haven't heard of Peppadews yet, it is about time! These delicious and tasty peppers are only made by one company in the entire world. And I have to say, these are the Golden Eggs-or at least the golden peppers. Spicy, flavorful and delicious, Peppadews are a fantastic addition to any salad, plus great options for appetizers as well!